By now you should know the drill. We are doing a podcast with each of the nine mayoral candidates — except Eric Johnson. Today we bring you Miguel Solis. Which street in Dallas would he rename for Dirk? Is he too young to be the mayor? These and other questions are answered in this podcast. Use the player below, or subscribe via the Apple podcast app or Spotify. You’re welcome. Texas Police Union Not Pleased with DA John Creuzot. The union wants the Dallas County DA removed because of his plan to not go after some low-level crimes, like first-time marijuana offenses. Cops Looking into Domestic Violence Allegation Against Dominique Alexander. The local activist denies attacking anyone. Jeff Hood, who works in activism with Alexander, went with the accuser to a hospital and hinted at Alexander having anger issues. New Ride-Sharing Zones in Deep Ellum. 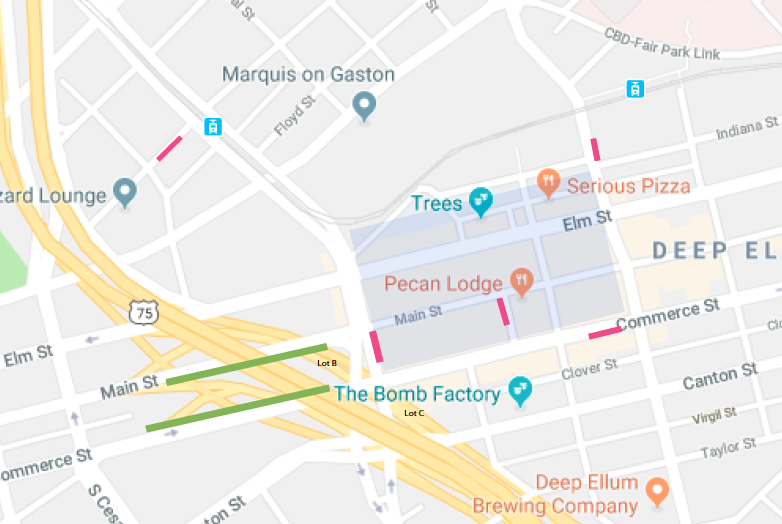 On any given weekend evening, and probably weekdays now, Deep Ellum has become a sinkhole for cars trying to get anywhere. I avoid it at night unless I’m seeing a show. But today, new 24/7 pick-up and drop-off zones for Uber and Lyft will debut in an attempt to ease traffic. Some people are concerned with safety issues over the new plan. We’ll see how this goes. Stars Bounce Back. Last night in Game 4, they beat the Nashville Predators 5-1. Game 5 will be in Nashville Saturday. Storms Weren’t As Bad As Expected. The thunder was loud, and I’m tired, but the hail in Dallas was pretty much nonexistent. Dallas appears to be headed for a serious weather event tonight. Several area meteorologists are calling for hail, potentially baseball- or even softball-sized, and several schools and workplaces chose to shut it down early this afternoon. It’s cleared out a touch around our offices, as well, and I heard a few folks talking about leaving their cars in the garages overnight so as to avoid potential hail damage at home. Probably a good call. Bishop Arts, the 10-block district that came of age generations ago near a streetcar stop, has spent the last 30 years becoming a destination. There’s retail and restaurants and bars and coffee shops, the clean white paint of Oddfellows and the enormous butcher’s diagram of a cow that adorns Lockhart Smokehouse. Further south are narrow streets dotted with Craftsman homes, some of which have been sliced into duplexes and quadplexes. It all fits together somehow, a mix of uses born from a street grid, a trolley stop, and old architecture with good bones made for repurposing. But this part of North Oak Cliff is changing. At some intersections, tall complexes now neighbor single family homes. This is perhaps because of Bishop Arts’ success and desirability, but also because of new zoning that allowed for these sorts of new builds. In 2010, the city cleared the way for larger commercial and residential structures along Davis Street. We are now seeing its result. There is a concern that this new direction is not for everyone, that longtime residents will become targets for deep-pocketed developers or succumb to the cost of rising property taxes. But proponents say it’s hard not to see the benefit: there are not enough apartments to meet demand, and the new developments allow people who work in the district to walk—or scoot or bike—to their jobs. This is at the core of the battle for the District 1 council seat, which is open because of Scott Griggs’ departure due to term limits. Candidate Chad West, Griggs’ planning commissioner, has raised the most money in the race, and his signs are found often in Bishop Arts businesses whose operators say they support him because of Griggs’ endorsement. The artist Giovanni Valderas, who became known for placing sad-faced piñata homes in empty lots near new developments, believes he can represent the people he fears have been left behind by City Hall. Sylvana Alonzo, the wife of former State Rep. Roberto Alonzo and owner of a small marketing and web design firm, has made affordable housing the cornerstone of her platform. How you feel about the direction of the neighborhood will likely guide your choice in candidate. There was a snafu with Mike Ablon. On the day of this recording, we were supposed to interview two people: Albert Black and Miguel Solis. But up shows Ablon right as we were finishing with Black. Did that stump me and Mark Goodman (Matt’s new name, which was given to him by Black)? Heck no. With about 15 seconds of prep, we dove into the interview. First question: what’s the worst thing Ablon has ever done on vacation? All that and more answered in this episode, which you can listen to with the player below or subscribe to via the Apple podcast app or Spotify. Police Say Edward Thomas Was Paid to Beat Trans Woman. Thomas was arrested Sunday night on aggravated assault charges and, with the FBI in on the case now as well, authorities are considering whether Thomas’ alleged act constitutes a hate crime. Police say someone offered him $200 to beat the victim after a traffic incident, and that more arrests could be on the way. Farmersville Settles Lawsuit Over Islamic Cemetery. Its City Council had unanimously shooed away the cemetery after some residents made known their Islamophobia. The city allowed the cemetery only after the federal government started investigating, and now under the settlement, it will train its employees about religious land use laws. Storm Heads for Dallas. It’ll blow in late this afternoon into the evening. WFAA calls for up to baseball-sized hail. Yowza. Stars Play Tonight. It’s a key game 4 at home, down 1-2 in the series. For the first time, the Commit Partnership has a president. Dottie Smith, who has led the organization’s Best in Class effort for the last year, started in the role this month. It’s a significant step for the 7-year-old, education-focused nonprofit, which brings together more than 200 institutions toward a goal of more equitable schooling for all. Commit CEO Todd Williams said late last year that with staff approaching 50 people, he’d be launching a search for the position. He didn’t have to look far. Smith moved to Dallas a year ago to head Best in Class, a piece of Commit that focuses on getting top talent to historically underperforming schools. With Smith’s leadership, the Coalition has helped institute the Accelerated Campus Excellence program—which incentivizes the best teachers to the schools that need it most and has been a part of the turnaround at Dallas ISD—to several other school districts in DFW. Councilman Philip Kingston faces an ethics complaint that he pushed for a zoning change in his East Dallas neighborhood that would allow him to rent out a garage apartment that he’s building on his property. Kingston was one of the loudest advocates for these so-called accessory dwelling units, or ADUs, which the City Council approved last June. The city created a way for neighborhoods to opt into an overlay to allow their homeowners to rent these out without having to get individual approval through the Board of Adjustments. The ethics complaint, which was filed anonymously, alleges Kingston skirted this process by advocating for an amendment of his neighborhood’s conservation code for his own personal gain. A couple weeks ago, at my editor’s urging, I checked in on whether homeowners had taken advantage of the city’s granny flat ordinance in the 10 or so months since it was approved. The city for decades did not legally allow homeowners to rent out apartments built in backyards or atop garages. As of last summer, people can. But nobody has (legally) taken advantage. The closest thing is a conservation district in Lower Greenville called the Belmont Addition, or CD-12. That district realized it would be easier to amend the language in its conservation code to allow for ADUs than deal with the city’s process. Chief Planner Donna Moorman says this is exactly what they did, thereby bypassing the city’s approval mechanism. Moorman said she knew of one resident of the neighborhood pushing forward with construction of an ADU. I wrote that story and included a quote from Kingston. He argued that the ordinance’s red tape was holding people back from applying. He didn’t mention that he and his wife, Melissa, are the ones building the granny flat in the Belmont Addition.